This is a stimulating book...The academic quality is very high, and the conceptual and methodological concerns are central to current debates concerning the second half of the twentieth century. The inclusion of a large geographic variety of cases is important and thought provoking. * Nancy L. Green, L'Ecole des Hautes Etudes en Sciences Sociales (EHESS), Paris These transfers of sovereignty resulted in extensive, unforeseen movements of citizens and subjects to their former countries. 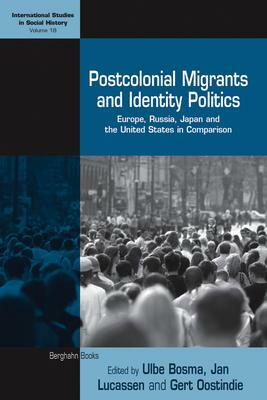 The phenomenon of postcolonial migration affected not only European nations, but also the United States, Japan and post-Soviet Russia. The political and societal reactions to the unexpected and often unwelcome migrants was significant to postcolonial migrants' identity politics and how these influenced metropolitan debates about citizenship, national identity and colonial history. The contributors explore the historical background and contemporary significance of these migrations and discuss the ethnic and class composition and the patterns of integration of the migrant population. Ulbe Bosma is Senior Researcher at the International Institute of Social History, Amsterdam. Jan Lucassen is Senior Researcher at the International Institute of Social History and Professor at the Free University in Amsterdam. Gert Oostindie is Director of the KITLV/Royal Netherlands Institute of Southeast Asian and Caribbean Studies in Leiden and Professor of Caribbean History at Leiden University. Ulbe Bosma is Senior Researcher at the International Institute of Social History, Amsterdam. He co-authored Being "Dutch in the Indies": A History of Creolisation and Empire (Ohio University Press 2008) and "European Colonial Soldiers in the Nineteenth Century: Their Role in White Global Migration and Patterns of Colonial Settlement" (Journal of Global History 2009: 4). Jan Lucassen is Senior Researcher at the International Institute of Social History and Professor at the Free University in Amsterdam. His recent publications include "Mobility Transition Revisited, 1500-1900: What the Case of Europe Can Offer to Global History" (with Leo Lucassen, Journal of Global Labour History 2009: 4) and Migration History in World History: Multidisciplinary Approaches (with Leo Lucassen and Patrick Manning, eds; Brill 2010). Gert Oostindie is Director of the KITLV/Royal Netherlands Institute of Southeast Asian and Caribbean Studies in Leiden and Professor of Caribbean History at Leiden University. His publications include Paradise Overseas. The Dutch Caribbean: Colonialism and its Transatlantic Legacies (Macmillan 2005) and Postcolonial Netherlands: Sixty-Five Years of Forgetting, Commemorating, Silencing (Amsterdam University Press 2011).